We accept Adobe Illustrator (AI) format with Creative Cloud version. Images in JPG or TIF format can also be printed. Files in JPG or TIF format need to be in actual size(1:1) with at least 150dpi. Please convert all Text to Path for Adobe Illustrator (AI) or EPS file. If using Adobe Photoshop to make JPG or TIF file, set the color mode to CMKY, as some of the colors in RGB mode cannot be printed. 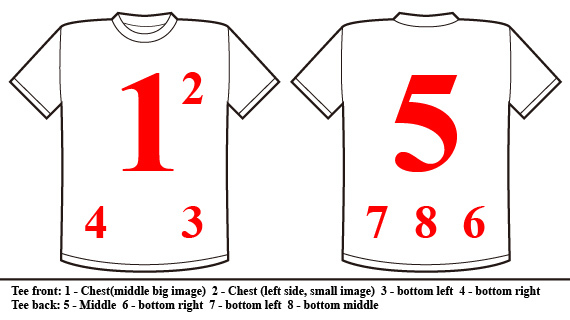 Client should own the copyright of the image or have the right to print it on the t-shirt(s).